RSVP and Pay by November 14, 2018. No refunds after this date. Only 25 tickets are reserved for our group. RSVP early. Play begins at 9am, please arrive inside by 8:45am to be seated as a group. I will email a meeting area closer to the date. The show runs approx. 1 hour and 5 minutes. 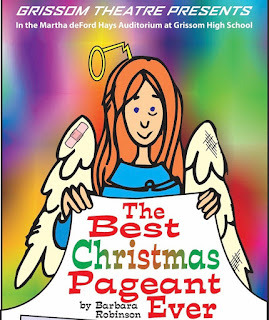 The Grissom Theatre Department presents its annual holiday favorite, The Best Christmas Pageant Ever. The Best Christmas Pageant Ever is a high-energy comedy about what happens when the “worst kids in town” decide they want to be in the annual Christmas pageant. The result is a hilarious yet touching play that teaches the town a lot more than any traditional show. Parking details to be emailed prior to show.